When a country-loving bachelor gets a rude introduction to a cultured, sophisticated city-girl, they instantly clash. But as they’re thrown together time and again, they realize, their two worlds might not be as far apart as they initially thought. Mom and Daddy have run away from home! 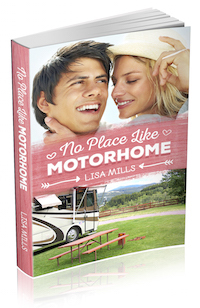 As Darcy Granger finishes her graduate degree and looks for employment, her parents make the inexplicable decision to abandon successful careers, lease their New York City apartment, and purchase a motorhome to become “full-timers.” As a young adult she should be eager to start her own life, but her wounded inner child mourns that her safety net has been pulled away and there’s no nest for her to fly back to. To make the transition easier, her parents invite her to stay with them while she looks for a job as a research librarian. Born and raised in New York City, Darcy struggles to acclimate to the campy lifestyle her parents have adopted. They drag her out on rural excursions where high-heeled shoes dare not go and forms of outdoorsy torture lurk around every bend in the road. Marc Fitzsimmons is a twenty-seven-year-old writer who travels the country, pulling a travel trailer behind his pickup truck and penning articles for magazines. He loves living a casual life on the go, seeing new sights and meeting new people at every stop. The career he’s chosen feeds his adventurous soul and fills him with satisfaction, but it’s definitely made it difficult to date. He’s almost given up the idea of marrying and having children, knowing the odds of finding a woman who wants to share his lifestyle are slim to none. When this country-loving bachelor gets a rude introduction to a cultured, sophisticated city-girl, they instantly clash. But as they’re thrown together time and again, they realize, their two worlds might not be as far apart as they initially thought.